Eagles quarterback Nick Foles catches the football in the new version of the "Philly Special" play that the team ran against the Atlanta Falcons. On the morning of June 14, just hours before they were honored at the ring ceremony and partied with Meek Mill, the Eagles players endured one final spring practice. It was the last day of mandatory minicamp and they were ready for their summer break. Coach Doug Pederson made it the shortest practice of the spring, but he didn't waste the day. During the group installation period and later during a team period, the Eagles ran versions of a play that looked similar to the most famous play in Eagles history. Nick Foles ran a pattern down the right sideline, catching a pass thrown by wide receiver Greg Ward. It was a Thursday in June, and the season opener was still 84 days away. The Eagles didn't work on the play much thereafter. Pederson didn't forget that June day. When he put his game plan together for the Eagles' 18-12 win over the Atlanta Falcons on Thursday, he added the play as a third-down option from the right hash mark. And when the Eagles needed a jolt on a third-and-5 from Atlanta's 41-yard line while trailing, 6-3, in the third quarter, Pederson called "Philly Philly." Foles took the snap and handed the ball to Corey Clement, who pitched it to Nelson Agholor, who threw it to Foles for a 15-yard gain and a first down. The Eagles captured the momentum — and soon took the lead — and the play became one of the biggest stories from the season-opening win. If the play looked familiar, though, it's not because the Eagles ran it in the Super Bowl. It's because the New England Patriots ran it in the Super Bowl — and a wide-open Tom Brady dropped the pass. "That's where we got it from," Pederson said. "We just put different people in the game." Except for the Eagles, it worked. When Foles approached Pederson before the Philly Special in the Super Bowl, he said "Philly Philly." That was not actually the name of the play. So in homage to that, Pederson named the new play Philly Philly. And Foles didn't need to go to his coach to call it. "Honestly, we were both thinking the same thing at the same time," Foles said. "I went over there to talk to him to say this might be a good time and he pointed to the call sheet and it was like, 'That was what I was coming over here for.' So it worked again." The Eagles took the Patriots' play and adjusted the formation, using a two-tight-end set instead of a three-receiver set. So while it seemed as if the Eagles were running the Philly Special 2.0, this one was actually a totally different play in the playbook. "They're two different plays with the same result," Pederson said Friday. "Philly Special was just the play we used in the Super Bowl for the fourth-and-goal, and Philly Philly was just basically the play we used last night but sort of derived from what Nick had mentioned to me in the Super Bowl — 'Philly Philly.' …Just different formations with the same result." Another big change was the person passing the ball. In the Super Bowl, the Eagles had Trey Burton, who was recruited to Florida as a quarterback. During the spring, the Eagles used Ward — a star quarterback at Houston. But Ward is not on the 53-man roster, and Pederson decided to use Agholor as the passer. Agholor doesn't have the same quarterback background. "Little league," Agohlor said of the last time he played quarterback. "I was the backup quarterback in high school, but little league." Watching from Chicago, Burton gave his approval on Twitter, sending "nice throw" to Agholor's account. "They both put the ball on the money," Foles said. "They are both 1-for-1." Foles now has two career catches, but anyone who watches him before games can see his hands. 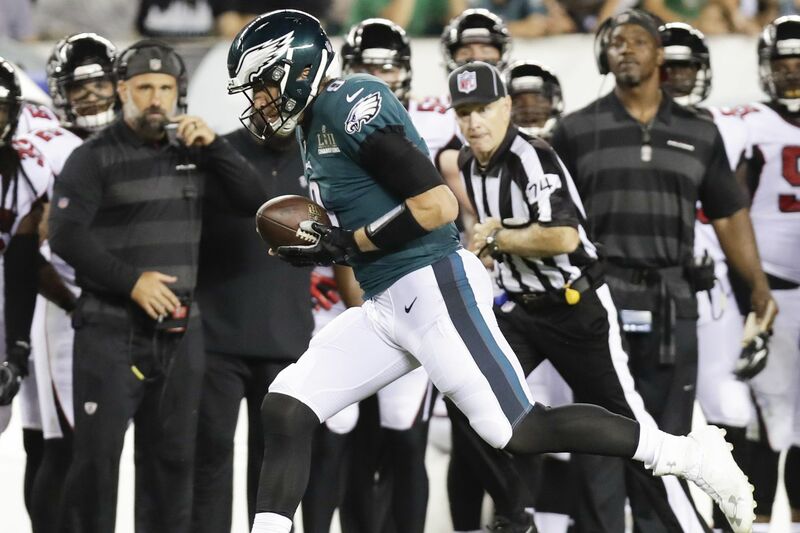 Foles runs routes and catches passes, allowing him to "be a kid for a little bit." An accomplished high school basketball player who received interest from major colleges, Foles has athleticism that has earned him praise from teammates and coaches. Agholor called him an "Ultimate Frisbee all-American." (The Eagles play Ultimate Frisbee during spring workouts.) Pederson is confident that Foles can catch the ball on those plays. "You've got to make sure that defense is going to be in man coverage and they're not accounting for your quarterback," Pederson said. "It's a little calculated risk. You're not going to do it every week, but we felt like we had a great opportunity to do it, and he did a nice job of securing the catch and getting himself out of bounds." After it was installed in the spring, the Eagles did not spend much time working on Philly Philly. Foles said they did it once in practice. Malcolm Jenkins didn't even know it was in the playbook. Falcons coach Dan Quinn expected the Eagles to run "gadget plays." The question was more when and what. As a play-caller, Pederson does not just consider whether the play is effective. He also considers the residual effect of the play. If it worked, the Eagles could shift the momentum of the game and energize both the sideline and the crowd. If it didn't work, the Eagles would still have fourth down to go for the first down, which was why Pederson elected to call Philly Philly on a third down at that spot on the field. "You're kind of in that two-down territory," Pederson said. "But at the time it was a little of both. I knew the play was going to be effective based on what the Falcons had been showing up in that situation, and then, two, I needed it to work and be a spark for the offense." Jenkins said it was "a great time to call it" because it "injected some juice into the crowd, the offense." The result changed the game for the Eagles. And just like after the Super Bowl, Pederson's creative play call became one of the biggest stories on the day after. "If you can get a team at the right time, sometimes it's great to have it in there," Foles said. "We also need to be able to catch it and everything. I love having plays like that. Our team loves it. I mean, everyone loves a good trick play."